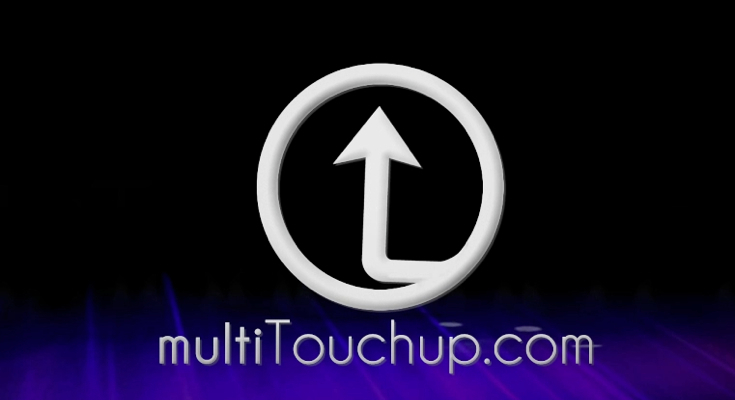 I’ve created a new MultiTouchup logo for the website and ordered up a few stickers to give out. It’s a circle with an arrow pointing upwards. Doesn’t get any more simplistic than this. I really just wanted something circular so I could build out this AE intro I was dreaming about. Here is the jazzy, rad-a-bad, and funky new intro video as it stands. I’m planning on using it at the start of video screen-cast and tutorials. It’s also shorter than the one I was using before which I think will be better. It’s not like you guys want to sit around and watch 15-20 seconds of meaningless introduction video. Check it out bellow and let me know what you think. If you live in the US and want a free MultiTouchup sticker just leave a comment below. I’ll contact you, get all your details and mail you one. The sticker is also circular and is simply black on white. Check it out below. Thanks for any suggestions or feedback! This entry was posted on Thursday, March 4th, 2010 at 4:25 am and is filed under Blog. You can follow any responses to this entry through the RSS 2.0 feed. You can leave a response, or trackback from your own site. Dig the new logo. Hook it up. Sweet !!!!!!!!!!! Can I get one? The logo is great! I like it a lot! and would love to have one! Good Job!